Brazen. That’s the perfect word to describe my attempt at making a bittersweet Chocolate Raspberry Torte… from scratch. Well, almost. I don’t have a chicken coop to retrieve fresh eggs from so a slight exaggeration it is. Well, it came out LOOKING okay per above… but…….. The kids didn’t put me up to this although my Little-Cake-Boss-Now-Dreadful-Teenager would have likely devoured it. Alas, she is gone for a week and a half on a bus vacation with my ex. 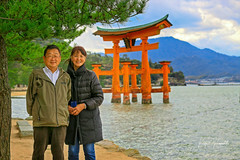 No, I don’t know where they are – not even in which state – which is part of the secret life they lead with their mother. So, I needed a distraction. Besides, I owed my good neighbors an experiment a treat. Their two youngest kids were a wonderful influence on my two little rug rats as they were growing up. Make the mess putting it all together. You will also need a food processor, two good quality 9″ cake pans, a wire rack, cardboard rounds for the cakes and parchment paper. Adjust oven rack to middle position and preheat oven to 325 degrees. Grease then line bottoms of the two 9″ baking pans with parchment paper. Grease the parchment paper then dust with flour. Since I don’t have a suitable bowl for this, I always use my trusty Japanese bowl. While the recipe says to melt the chocolate and butter in a bowl over some barely simmering water, I cheat (via Cook’s Illustrated). 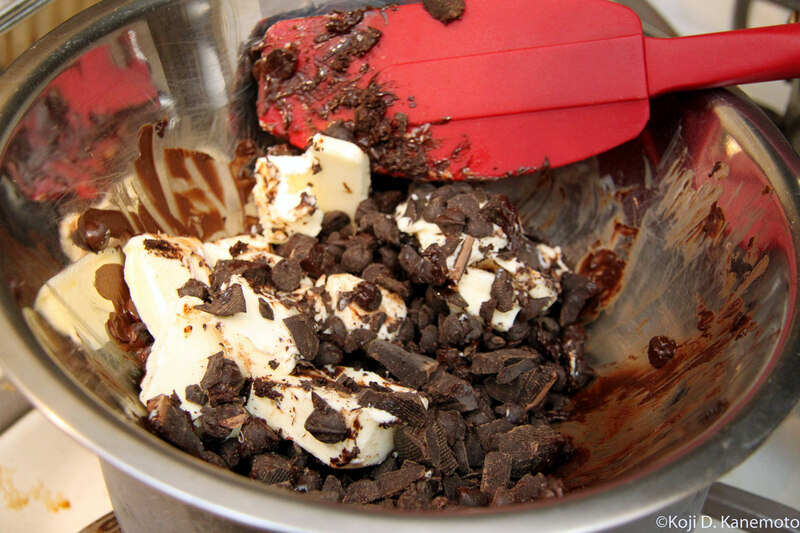 I zap the chocolate chips and butter for about 1-1/2 minutes at 50% power. Stop when the chips pretty much lose their shape but don’t overheat. 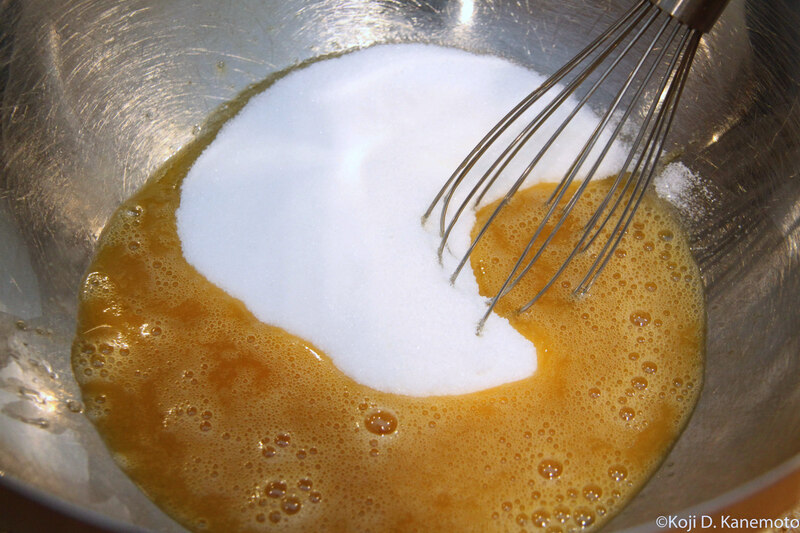 Whisk gently and let cool 30 minutes, then add vanilla extract and espresso powder. Whisk gently again. Whisking the melted chocolate and butter. Cool for 30 minutes before adding extract and espresso powder. Process 3/4 cup almonds in food processor until coarsely chopped, six to eight 1-second pulses; set aside to garnish cake. Coarsely chopped sliced almonds. Remember to toast! Process remaining cup almonds until very finely ground, about 45 seconds. Add flour and salt and continue to process until combined, about 15 seconds. Transfer almond-flour mixture to medium bowl. Ground almond slivers after flour and salt added. Process eggs in now-empty food processor until lightened in color and almost doubled in volume, about 3 minutes. 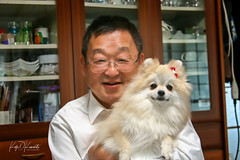 With processor running, slowly add sugar until thoroughly combined, about 15 seconds. The five eggs after three minutes. Remember to use room temperature eggs! 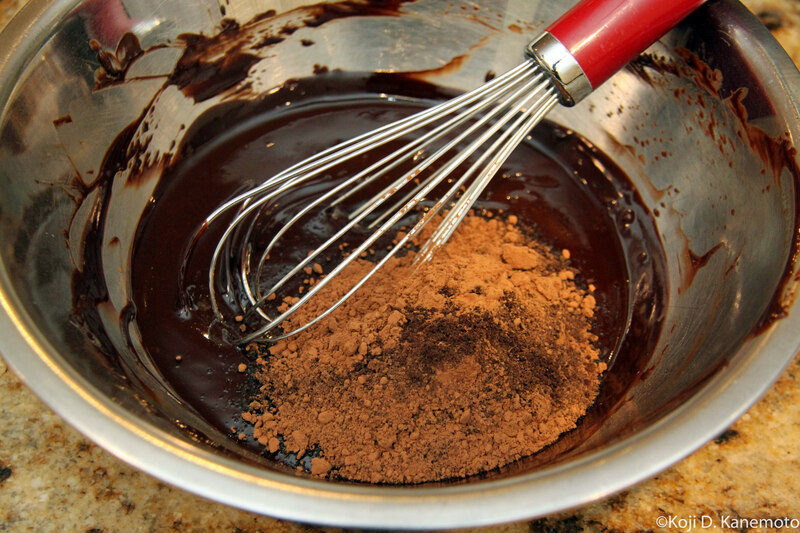 Using whisk, gently fold egg mixture into chocolate mixture until some streaks of egg remain. 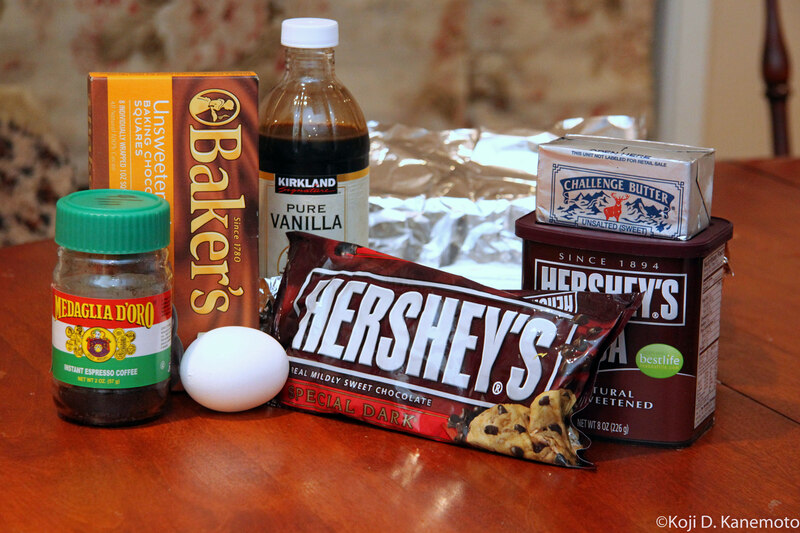 Sprinkle half almond-flour mixture over chocolate-egg mixture and gently whisk until just combined. Sprinkle in remaining almond-flour mixture and gently whisk until just combined. After some folding of the eggs into the chocolate mixture. Note the streaks. Addition of first portion of the ground almonds and before whisking. After addition of remaining ground almonds. Frankly, I may have over-whisked it. Doing so breaks down the aerated eggs. One cake before inversion. You do not have to invert the second cake. Transfer cakes to wire rack and cool completely in pan, about 30 minutes. Run paring knife around sides of cakes to loosen. Invert cakes onto cardboard rounds cut same size as diameter of cake and remove parchment paper. Using wire rack, re-invert 1 cake so top side (the shiny side) faces up; slide back onto cardboard round. Place ½ cup raspberries in medium bowl and coarsely mash with fork. Stir in raspberry jam until just combined. Spread raspberry mixture onto cake layer that is top side up. Top with second cake layer, leaving it bottom side up. (Tricky!) Transfer assembled cake, still on cardboard round, to wire rack set in rimmed baking sheet. A horrible cell phone pic; it looked much better than this. 🙂 Smooth filling to almost the edge. Placing the second cake on top of this slightly squeezes the filling out. Using fine-mesh strainer, sift reserved almonds to remove any fine bits. Holding bottom of cake on cardboard round with one hand, gently press sifted almonds onto cake sides with other hand. Arrange raspberries around circumference., placing one raspberry at the 12, 3, 6 and 9 o’clock positions; evenly place the rest of the raspberries using the first four raspberries as a guide. Refrigerate cake, still on rack, until glaze is set, at least 1 hour and up to 24 hours. Transfer cake to serving platter, slice, and serve. Did you know Hostess is now owned by a Mexican company? What’s made in the US of A anymore? Long name, huh, for brownies? Well, my little Cake Boss asked for me, her servant, to make her some brownies. And since I had all the ingredients at the house, I decided to do it from scratch…again. Wasn’t someone supposed to tell me to stop this non-sense? Sugar, salt and unbleached flour are not shown. As a side note, I much prefer Hershey’s unsweetened chocolate. It’s a lousy photo but that’s a foil-lined baking pan in the background. 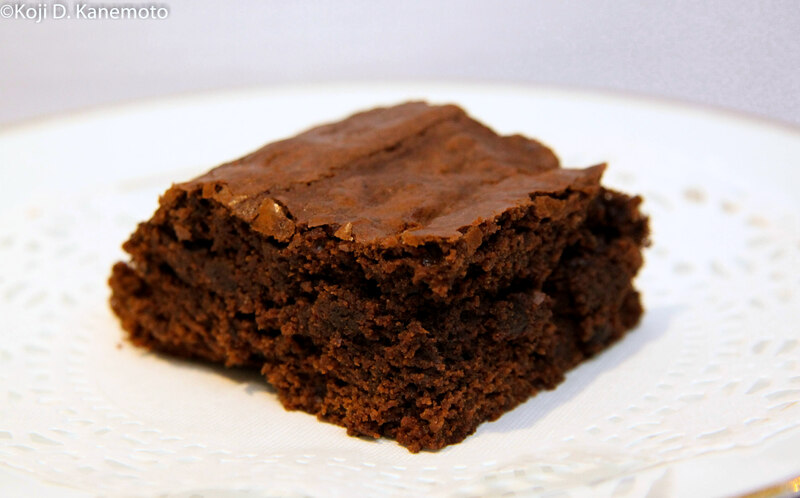 Per my yes-yes beacon, Cook’s Illustrated, the classic brownie should be moist, not “goopy” or dry. The chocolate flavor should most of all be decadent – especially for my little Cake Boss. Gotta raise her right, you know. Like avoiding the supermarket pre-mixed who-the-heck-knows-what’s-in-it stuff. Well… it’s really ‘cuz I wanted to avoid the uncomfortable situation experienced after baking the little Cake Boss a classic white double-layer birthday cake. The little Cake Boss almost fired me because I didn’t do as she told me to. Melting the chocolates and butter over barely simmering water. Gotta keep stirring! 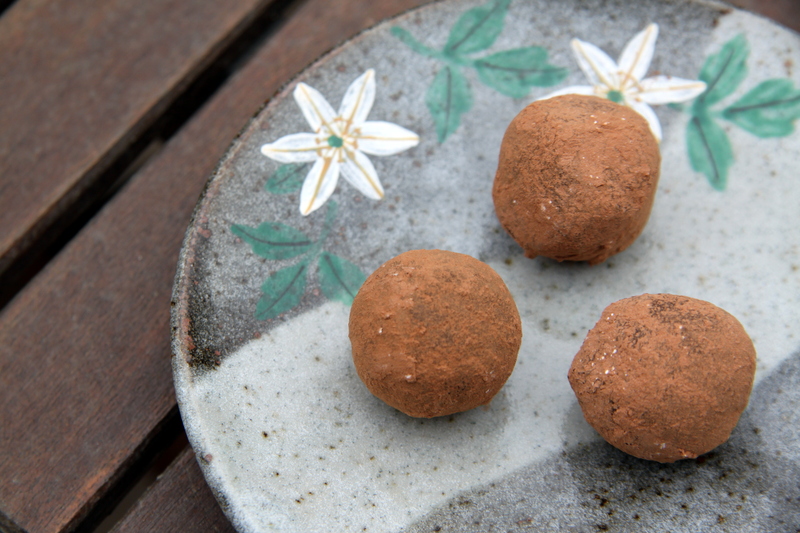 Just like my homemade chocolate truffles. After it all melts, whisk in the cocoa and espresso powder. Set aside. Whisk eggs, sugar, vanilla extract, and salt. You then whisk while pouring in the still warm chocolate yumminess. Fold in the flour and pour into a foil-lined baking pan. Smooth over as best possible then bake at 350 degrees for about 35 minutes. Don’t overbake! I’ve learned my oven runs on the hot side and items need to be rotated. 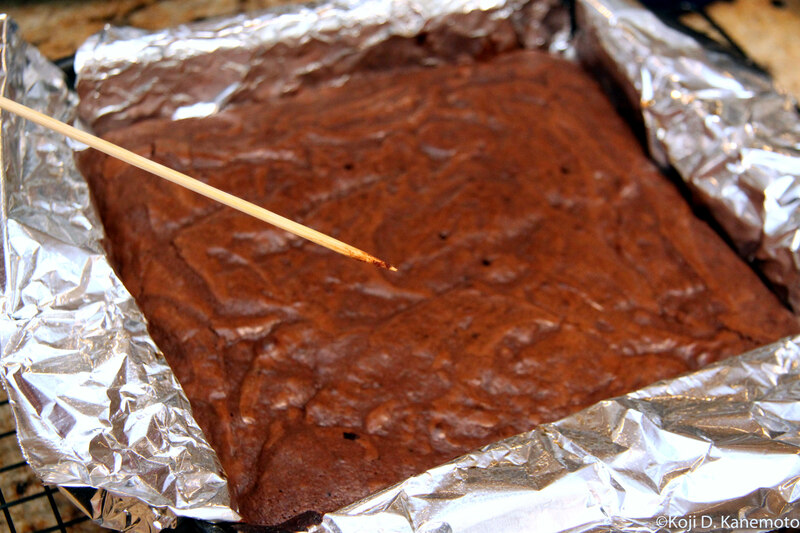 It’s perfectly done if it domes slightly and some sticky brownie crumbs stick to a toothpick. Very logical (unlike the illogical “Common Core Mathematics” now being taught in elementary schools). After cooling for two hours, lift out the brownies with the foil liner and pig out! Actually, this first batch of homemade “triple-chocolate espresso brownies” came out REAL good as the little Cake Boss came back for a second piece. I guess I’m still employed at the house. 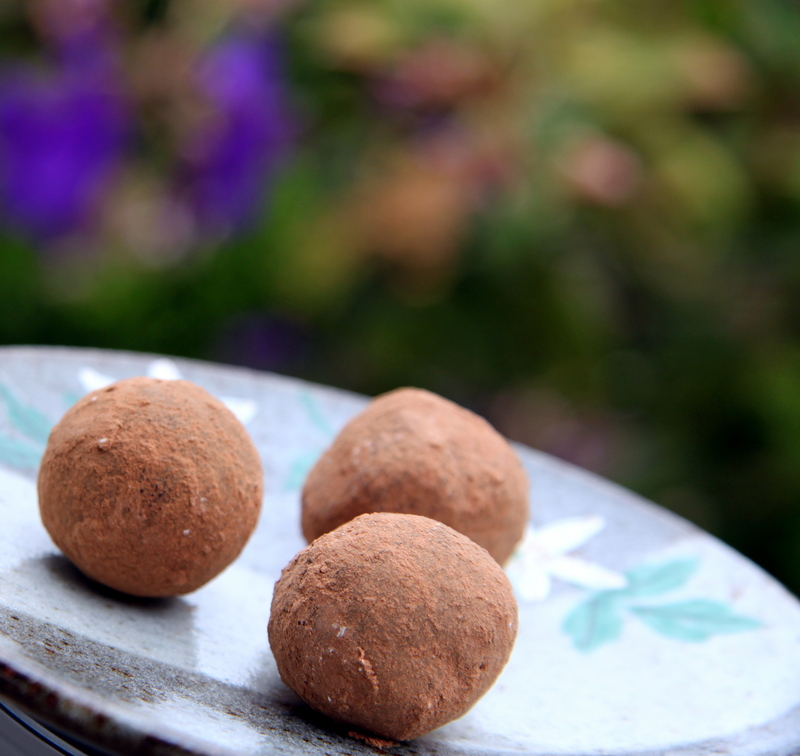 My homemade chocolate truffles are popular with the gals. Unfortunately, they’re pretty popular with some of my buds, too. Oh well. Following the well explained recipe in my cooking bible, Cook’s Illustrated, I made a batch to take to a couple of my friend’s 4th of July block parties. Frank Sinatra would’ve been jealous with all the attention I got from the ladies. 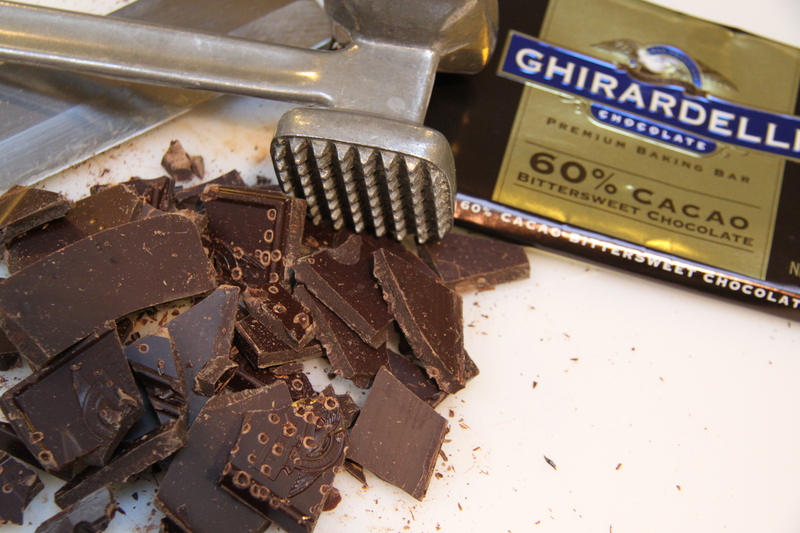 The ganache is the secret. Rolling the ganache into balls is the tough part. My knife skills are non-existent. But being a former mechanic, I cheat. The “hammer when in doubt” approach always prevails.